Gisele Bundchen, who is the highest earning supermodel in the world, was spotted with her two young children and quarterback husband Tom Brady as they boarded a private jet in the snowy Boston weather on Jan. 22. It's likely the multi-million dollar couple is travelling somewhere with warmer temperatures (just like Eva Longoria, Farrah Abraham and more), as NFL player Tom's playoff season with the New England Patriots has come to an end. Two days ago, Gisele used Instagram to complain about the terrible weather while working, so it definitely seems like this family is in need of some warmer climates! 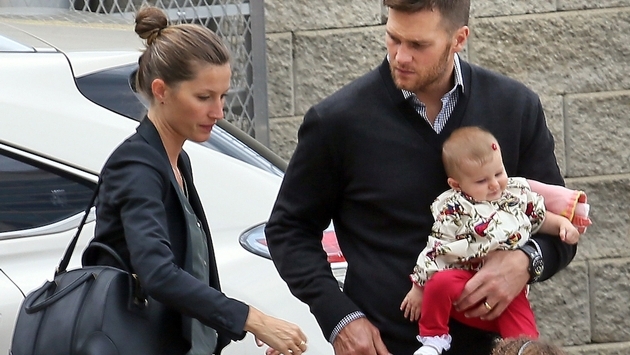 While boarding the private jet, Gisele, 33, appeared to be bracing the cold as she cradled baby Vivian in her arms. Not far behind, Tom was seen carrying his young son Benjamin, 4. It's no surprise that Gisele and Tom, 36, chose to fly on a private jet -- the couple was named the second highest earning celebrity duo by Forbes, behind Beyonce and Jay Z. With a combined $80 million earned in one year between 2012-2013, they can afford just about ANYTHING! We suggest they buy an island and just set up camp for the next few months. What do you think? Check out a photo of the family from three months ago -- perhaps they'll return to this exotic location!